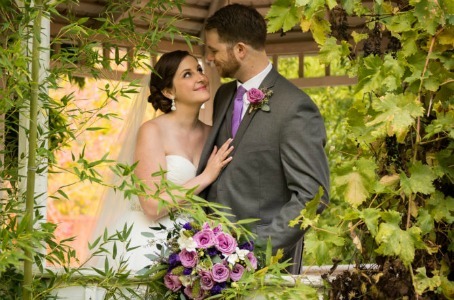 The Arbor is a romantic setting for your ceremony with seating for up to 300 guests. Located on the west side of the property, the Arbor is built with Greek-style columns and surrounded by a lush lawn and vibrant roses. Small white blooms are sprinkled throughout the ceremony site for a simple and elegant backdrop to compliment any wedding colors. This scenic area is great for an evening wedding with the sun setting behind the mountains. A pathway connects the Arbor to the Courtyard, where you can continue your festivities with an outdoor reception. 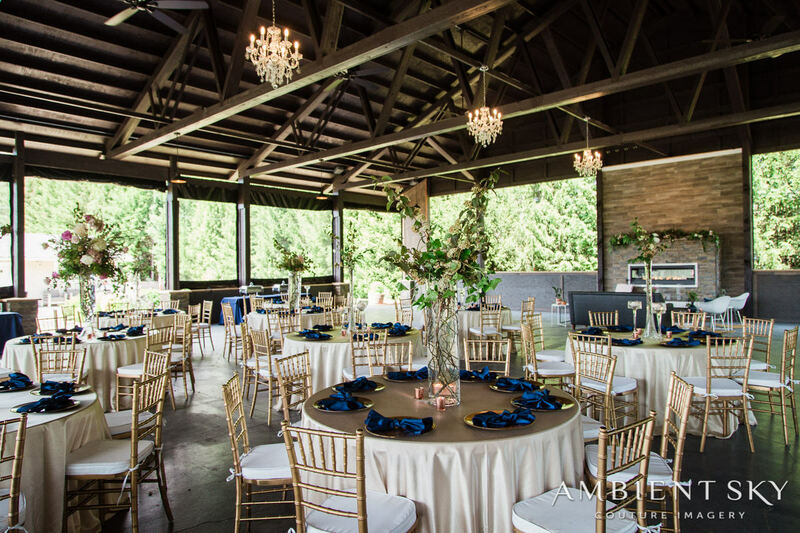 The Courtyard is our outdoor/ partial indoor Reception and Event space – with seating for up to 300 people. This area includes our newly built Pavilion, as well as access to our Private Salons and Public guest bathrooms. There is also access to our newly Paved Parking lot, as well as our Catering prep area. Our newly built, magnificent Pavilion is truly One of Kind! It has over 5,200 sq. ft. of covered space, along with custom drop pendant lights, crystal chandeliers, ceiling fans, Partial half wall and side wall, Fireplace accent wall, and custom clear side wall. It also includes access to our luxurious Salon and Lounge, as well as a private entrance and parking for the wedding party. Pavilion side walls are very elegant, while allowing you the full view of our outdoor areas. They are easy to use, and available for every event. This space is also situated right next to our Countryside Meadows area – making it a perfect spot to spill out into for an outdoor dance floor, outdoor lounge, kids play zone, lawn games, and so much more! Whether your event is big or small, this space will suite you perfectly. We can set for a small gathering, and create a cozy atmosphere, or set for a large event up to 300! This might include the need to spill out onto the countryside meadows grass for fun lawn games, outdoor lounge, or outdoor seating! 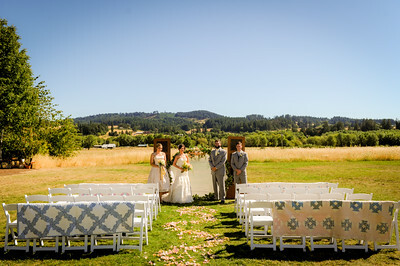 This expansive and open space of rustic meadow field is nestled right next to the Pavilion. What a panoramic view! With the countryside all around, this site has rolling hills and tree groves as the backdrop with sites of barns and silos in the distance. This space is great for ceremony, cocktail hour, lawn games or just for you and your guests to enjoy. Helicopters can land here for a grand entrance or exit! This grassy and open space is great for lounging, lawn games or your corporate, social or private event! We have an actual sandy beach next to our rippling blue pond, right here in Newberg! It is surrounded by an abundance of fragrant flowers, towering trees and a small stone wall. PLUS there is a covered Cabana to use as well with an integrated sound system to play music from your phone or ipod. This private area is perfect for a more intimate ceremony or reception of 100 guests or less. Cocktail Hour: Have your cocktail hour setup on the Beach and Cabana. Your guests can enjoy hors d’oeuvres and drinks while walking in the sand and enjoying the sound of lapping water on the pond. Lounge & Games: Set up a swanky beach-side lounge for your guests. Add in some games or a smore’s bar, and it’s a hit. Nestled lakeside, the Cabaña offers covered seating for up to 24 guests. 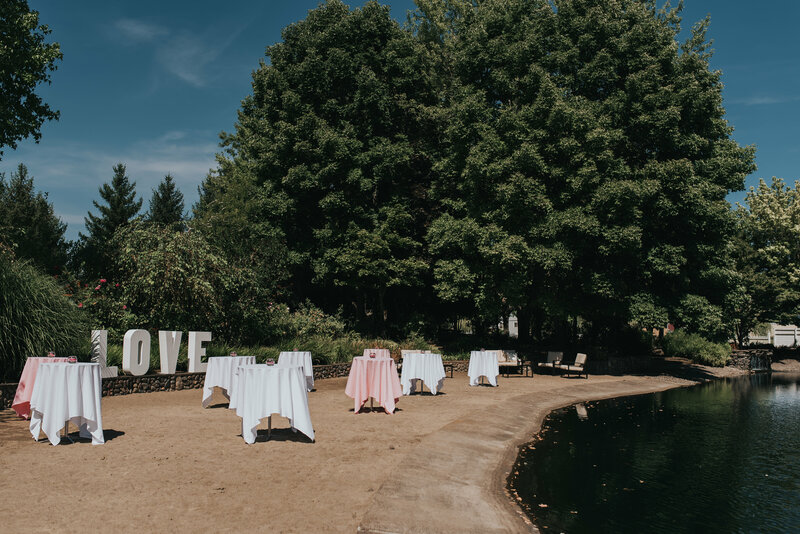 It is perfect for a small, intimate gathering, where you and your guests can enjoy an afternoon brunch or an intimate dinner right next to the lake. Enjoy the charming open view, full length sliding side windows and charming chandeliers. The Shaded Grove offers a peaceful place to relax, enjoy nature and recover from the afternoon sun. Dappled light plays through the trees as birds chirp and wind chimes softly ring. The soothing sound of the water fall, with its water trickling down the rock wall into the small looking pond, will gently play against your ear as you enjoy the sweet scent of flowers in the air. Seating is nestled throughout the heart of this peaceful garden for anyone to take in all the beauty. At night twinkling lights in the trees create a romantic and memorable experience. 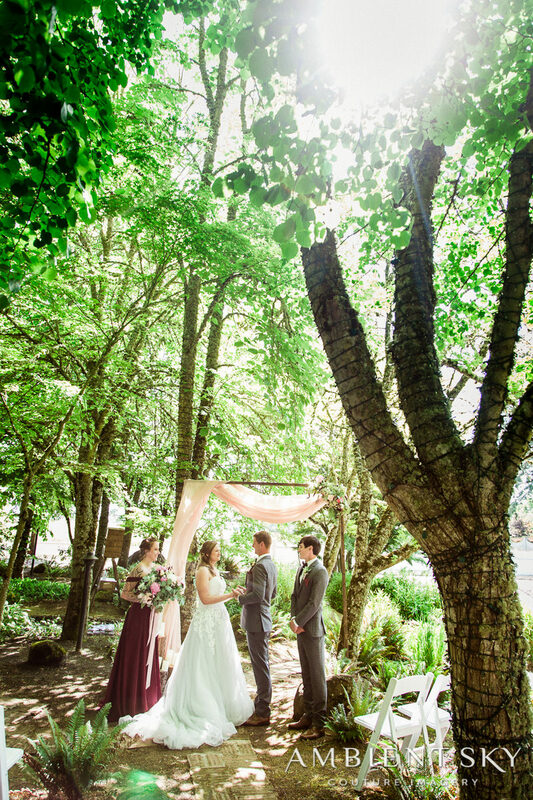 This is a beautiful spot for small elopements – from 10 to 50 people. This is a private and picturesque spot for a first look, couples photos, or group/family photos. You could also stage your photo booth here! This cool and shaded space offers a nice quite spot for guests attending your event. A unique and fun spot for a photo booth as well! We have so many beautiful sites on the property! The Gazebo, The Stone Bridge, our many Rose Gardens, the Bamboom Backdrops! These are perfect places for a private moment alone, a stunning photograph, or a majestic backdrop.